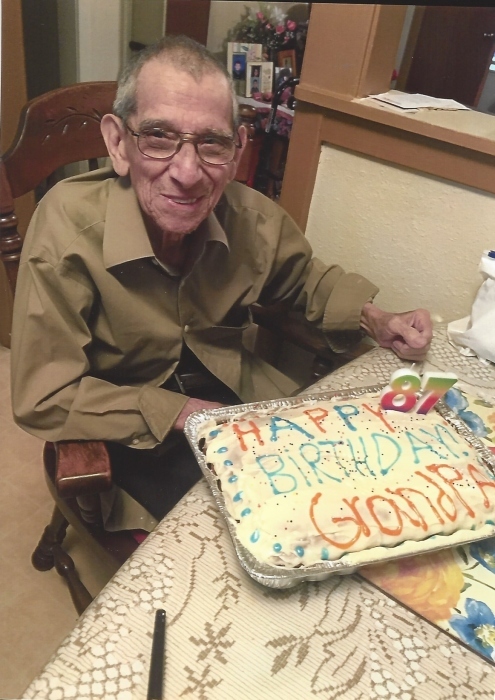 Manuel Gonzalez Rodriguez, age 89 of Victoria passed away Wednesday, March 27, 2019. He was born June 12, 1929 in Victoria to the late Manuel Rodriguez Sr. and Maria Gonzalez Rodriguez. He is survived by his wife, Felis Rocha Rodriguez of Victoria; daughters, Mary E. Quintanilla of Victoria, Sylvia R. Flores (Robert) of Placedo and Diana Rodriguez (Richard) of Freeport; son, Joe M. Rodriguez of Victoria and brother, Albert Rodriguez of Katy. He is also survived by five grandchildren, 13 great-grandchildren and two great-great grandchildren. He is preceded in death by his parents; sisters, Julia Carabaza, Felice Padilla and Merced Moya; brothers, Marcelino Rodriguez and Larry Rodriguez (Tuc). Visitation will begin Monday, April 1, 2019 from 5 – 9pm with a rosary to be recited at 7pm at Angel Lucy’s Funeral Home in Victoria. Visitation will resume Tuesday, April 2, 2019 at 8:15am at Our Lady of Sorrows Catholic Church with a funeral mass to be celebrated at 9am. Burial to follow at Resurrection Cemetery. Pallbearers will be Richard Rodriguez, David Rodriguez, Robert Flores Sr., Robert Flores Jr., Felix Quintanilla and Frank Mendoza. Honorary Pallbearers will be Joe Rodriguez and Ray N. Williams. Under the direction of Angel Lucy’s Funeral Home in Victoria, 361-575-3212.